The Bortles deal really isn't all that terrible, term is more than good and the AVG/YR puts him in the bottom third of the league for starters, and even that is misleading since many of those guys (i.e. every rookie since 2014) will be getting new deals by the time Bortles deal runs out. It's very likely he has a bottom five AVG by 2020. The Peters deal is poor, obviously two third rounders for a top ten at his position player suggests this was a moving on from a guy more than asset maximization. Although the fact no one beat that offer, despite CB being another position where the need is desperate for many teams, kinda suggests his rep around the league isn't very good. Still, for a one year gamble for the Rams, they could easily win the Super Bowl and just let him walk after that. As far as Jerry goes, well, it's being made out as a fine, but really the other owners just want him to pay back the additional expenses he made them incur with his Zeke tantrum last year. But anytime Jerry loses, it's the world who wins, so haha Jerry. Shaquem Griffin ripped off 20 reps at 225 pounds on the bench press at the combine with one prosthetic hand. He wasn't even invited to the combine originally. This guy was instrumental in UCF being an undefated team this season. I hope this guy contin use to impress, forces his way up the draft board and gets it done in the NFL. He is a remarkable young man. Truly. Here is his players tribune piece from yesterday. and one day later, Shaquem Griffin has run a 4.38 in the 40 yd dash. That's outstanding for a linebacker. Definitely hard not to root for this kid! NFL referee Ed Hochuli has retired, the league announced Tuesday, ending a colorful career that made him one of the most recognized game officials in American sports. Known for his long-winded explanations and exposed biceps, Hochuli, 67, will serve as an independent consultant to the league. The NFL promoted his son, back judge Shawn Hochuli, to replace him. One of the great characters of the game. Eagles trade for Michael Bennett? That's a scary good line to have. Him and Avril coming in to get a pass rush to force qbs to throw into Sherman and Chancellor and Thomas really took Seattle's defense to the next level. Bennett can still play when he wants and should have 1 or 2 years left at a decent level in the right system, though his annual contract complaints were always a challenge. And he plays right on the edge too, both on timing to get across the line, and aggressive in some of his hits. Sherman seems to be on way out as soon as today too, coming of Achilles surgery course. Most don't like his trash talk and speaking his opinions, but he backed it up his while career and basically eliminated the right side options for qbs who didn't throw there. Graham likely gone. A bad signing Zach Miller was a great TE,steady and reliable as Wilson's safety valve. Putting all the resources they did into Graham was overkill and never really worked out. Wilson taking over Grudens QB camp show on ESPN, too. Rounding out Seahawks news from earlier in offseason is that basically most of their coaches have moved on. Norton back though as DC after a week in Oakland. Schottenheimer as OC. So, the rebuild is on. A lot of good teams in this era, and 1 play away from back to back to back Superbowl wins. A rebuild of the defense up front with Avril and his injury and now Bennett gone. Good Lbs still. Secondary with Chancellor assuming his injury is ok and Thomas still there. Offensively have to find a running game, a reliable o line and some playmaker outside if Baldwin at reciever. Will have some money to do that with the loss of Bennett, Sherman and Graham. Last edited by browna; 03-07-2018 at 01:07 PM. Weird trade as it puts the Eagles at $16M+ over the cap. I'm guessing Curry, Celek, and Smith are all gone, but even considering those three and a Foles trade they'll still only have about a $1M in cap space and I don't think that factors in the rookie reserve for draft picks. I'm wondering if this move is a precursor to trading or cutting Brandon Graham. His cap hit is less than Curry's. Curry is as good as gone. The Eagles are up against it but there is no way you pass that up for that price. Celek will get reworked for $2mil or so. It'd be so Browns if they took a RB at 1 and Darnold/Rosen turned into stars somewhere else. The Browns are really bad. This is a QB class rife with high ceiling, low floor QBs. Yes, QB is important, but a mediocre QB with a good to great roster can go a long way. 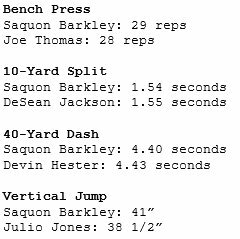 With the shift in NFL offenses towards a more quick passing, get the ball in your playmakers hands approach, Barkley seems to fit that mold rather well. And frankly I don't think he makes it past the Giants. Maybe doing the most Browns thing is actually the smart move here rather than reaching for a QB simply out of desperation. Besides, Hue needs to win next year and I'm almost certain McCarron will be going to Cleveland. Add Barkley to the mix and that could be a decent offense. I think they should take Barkely at #1. He won't be there at 4 because i dont think either of the Giants/Colts let him slide, but at least 3 of Rosen, Darnold, Josh Allen, and Baker Mayfield will be. The Colts won't draft a QB and if the Giants dont either (unlikely) all 4 would be there for them to choose from. I don't think Celek gets reworked. He's gone. There's just no cap space for him. Played around a bit on overthecap.com and even by designating Curry as a post-June 1 cut, trading Foles, and cutting Smith and Celek, the Eagles are left with around $5.8M in cap space, which they'll still need to sign draft picks with. They can probably free up a bit more cap space by extending Graham and converting his base salary into a bonus but they're also going to want to carryover as much space as possible for next year when they have Agholor, Darby, Hicks, and Ajayi up for extensions. Also very likely that they give Wentz gets his big contract next year. two, because the Colts would get incredible offers from teams like the Jets, Broncos etc to draft either Rosen or Darnold. The Browns have been gifted a second top 5 pick - that's a huge opportunity, and I wouldn't get cute because of it. A QB at 1 and a safety or pass rusher (Garrett/Chubb would be an unreal duo) at 4 ... that's amazing. I don't know, drafting Barkley and then betting on a project likr Allen or a wildcard like Mayfield just seems stupid to me. I think Darby will be gone, traded or cut this offseason. Celek at 33 has very little value and if the Eagles offer to rework at $1 or $2 mil he jumps at it. We are definitely going to lose some key pieces but you also have to take advantage of Wentz on the entry deal. Once he signs for $20-$30mil our window is pretty much shut. They can take Barkley at #1 and still take whichever mediocre PAC12 QB they want. If they take the QB first I believe Barkley will be gone by the time they pick at 4. I think Darby will be gone, traded or cut this offseason. I don't think you cut Darby. He was up and down while recovering from the ankle injury but he was very good in the playoffs. I'd rather keep Darby than Mills bit Schwartz seems to really love Mills. I'd be open to trading Darby for LB help or see if he can play in the slot and allow Jones to play the outside with Mills.